A pioneering study of Australian passport office staff by a team of psychologists from Aberdeen, York and Sydney, revealed a 15% error rate in matching the person to the passport photo they were displaying. In real life this degree of inaccuracy would correspond to the admittance of several thousand travellers bearing fake passports. The findings are published today (Monday August 18) in the journal PLOS ONE. They add to University of Aberdeen led research funded by a £1.5million European Research Council grant that indicates one passport photo is not sufficient for security systems to be accurate. This work suggests security measures would be enhanced if passports carried a multitude of images of a person. Professor Mike Burton, Sixth Century Chair in Psychology at the University of Aberdeen said: “Psychologists identified around a decade ago that in general people are not very good at matching a person to an image on a security document. “Familiar faces trigger special processes in our brain - we would recognise a member of our family, a friend or a famous face within a crowd, in a multitude of guises, venues, angles or lighting conditions. But when it comes to identifying a stranger it’s another story. 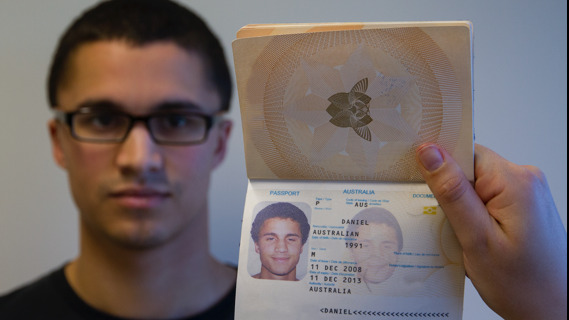 The ability of Australian passport officers, for whom accurate face matching is central to their job and vital to border security, was tested in the latest study, which involved researchers from the Universities of Aberdeen, York and New South Wales Australia. It was found that on 15% of trials the officers decided that the photograph on their screen matched the face of the person standing in front of them, when in fact, the photograph showed an entirely different person. Dr Rob Jenkins from the Department of Psychology at the University of York said: “This level of human error in Australian passport office staff really is quite striking, and it would be reasonable to expect a similar level of performance at UK passport control. UK Passports are valid for a 10 year period and as a result officers also have to take into account changes in a person’s appearance over time. In a second test, the passport officers were asked to match current face photos to images taken 2 years ago or to genuine photo-ID documents including passports and driving licences. Error rates on this task rose to 20% - a level of performance that was no different to a group of untrained student volunteers who were also tested. Professor Burton added: “This study has importantly highlighted that the ability to be good at matching a face to an image is not necessarily something that can be trained. “It seems that it is a fundamental brain process and that some people are simple more adept at it than others. The study of Australian passport office staff adds to research being conducted at the University of Aberdeen asking if security measures would be enhanced if passports carried more than one image of a person. It’s hoped the research – which involves collaboration with worldwide passport controls – could lead to changes in how security systems operate in the future. Professor Burton continued: “This separate study is examining if having a multitude of images taken under different conditions presented on a passport would increase precision in facial recognition. “What has been missing in the development of security technology so far is the fact that one photograph does not give us a true representation. “There is a great emphasis on a passport image to fit all purposes but people often comment on the fact that their passport photo looks nothing like them? This observation turns out to be true when tested scientifically. “Findings from our studies show that what really matters when you learn to recognise someone is the range of pictures you see – all the possible ways a person can look in photos. “It seems strange that we expect a single passport shot to encompass a person and allow us to consistently recognise them. If we are stuck on the concept that a good representation of a person is achieved through one image, then we are setting ourselves up for errors. “Could there in fact be an argument for our passports to contain a multitude of images, taken at different angles, in different lighting and formats? This is certainly something our study is examining. “Unlocking the fundamental brain process that occurs when we see someone we know is the key here.